Be the first to share your favorite memory, photo or story of ALVA . This memorial page is dedicated for family, friends and future generations to celebrate the life of their loved one. Age 84, of Nanakuli passed away on November 1, 2018 at Queen's Medical Center in Honolulu. She was born in San Francisco, CA and was a registered nurse in Hawaii and California for 41 years. Predeceased by husband Henry; sons Cane and Shane Kaneaiakala and sister Dorothy Diascenti. Alva is survived by children Erin, Kainoa and Erika; 4 grandchildren; siblings Dan O'Connor, Donna Ruiz, John Ethridge, Diane Sequeira, Cheryl Ethridge and Kris Eske. To send flowers or a remembrance gift to the family of ALVA O'CONNOR KANEAIAKALA, please visit our Tribute Store. 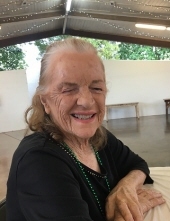 "Email Address" would like to share the life celebration of ALVA O'CONNOR KANEAIAKALA. Click on the "link" to go to share a favorite memory or leave a condolence message for the family.